Since the January 11th, the station was undergoing tests. Port retention flow on the platform is one of the novelties. The Sacomã Station (Line 2 - Green) of the São Paulo Metro was officially opened yesterday (January 30th) at 11h30am. The Station will operate during business hours. From Sunday to Friday, from 4h40am till 0h11am, and on Saturdays from 4h40am till 1am. Located at Rua Greenfeld, between the streets Bom Pastrol and Lino Coutinho, the station is one of the most modern in Latin America, with doors on the platform composed by glass doors working to reduce the risk of dropping on the Metro line when the train is not there. The Station also has humidifiers and air resources will bring environmental benefits, such as the reuse of rainwater and prioritizing lighting natural, which reduces energy consumption. Two new other Stations will be delivered on the next upcoming months. 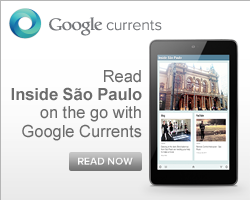 They will be the Tamanduateí and Vila Prudente. The Stations will be part of the same line that goes along Paulista Avenue, coming from Vila Madalena and soon, reaching the Vila Prudente on the city East Zone. 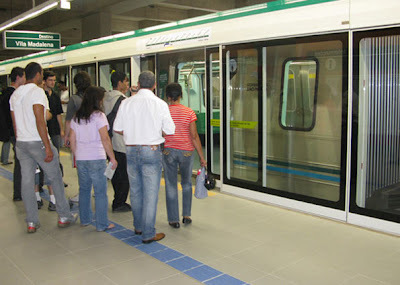 The lines will connect the metro line with the CPTM (Metropolitan Trains). The City Council expects to rise from 420 thousand to 830 thousand users every day. Besides the retention door the brand new Sacomã Station has another feature: an automatic turnstiles using glass blocks, ready to be open when you touch the ticket.